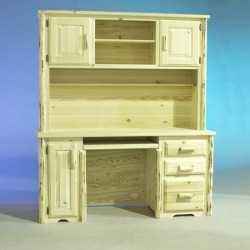 These solid pine amish made computer desks are built to last for MANY years of good use! 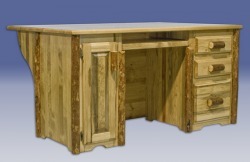 Solid pine construction with rustic log trim. 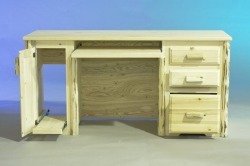 Desk with glide pull-out for keyboard, has 3 drawers. Overall dimensions are 63"W x 22"D x 31"H.
Letter sized file drawer, computer tower drawer and keyboard shelf all utilize full-extension slides while the remaining two standard-sized drawers employ easy-glide drawer slides for years of dependable, no hassle use. Your computer tower fits nicely into the compartment on the left side with openings in the back for cords and wires. 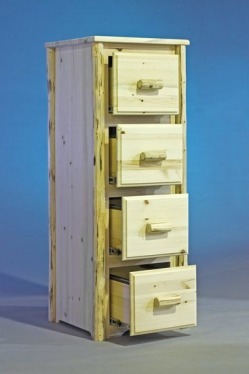 The bottom drawer on the right side acts as a small file cabinet. 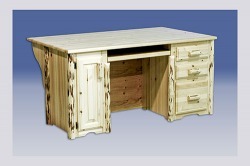 View and Purchase LOG OFFICE FURNITURE at our SECURE online store HERE! 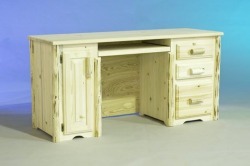 With over 1100 square inches more surface area than our regular computer desk, this one is perfect for the executive who has a cluttered desktop... and/or for doing interviews. 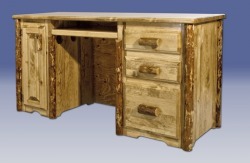 The rustic desk with hutch is as functional as it is appealing, complete with slide-out keyboard and slide-out drawer for the computer tower, for easy access. 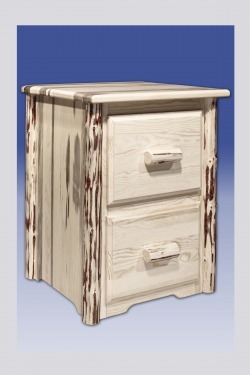 The desk features two multi-use drawers and a larger drawer to accommodate letter sized files. 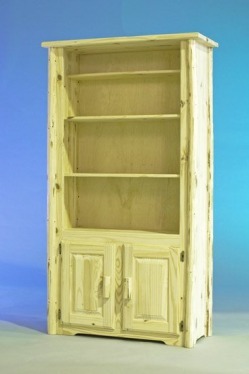 The hutch features two small doors and multiple shelves. 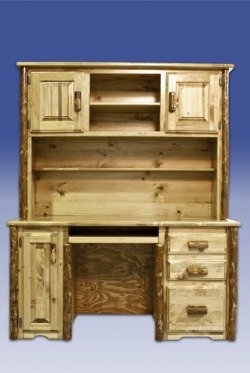 Overall dimensions are 63"W x 22"D x 74"H. This product is shipped in two pieces (hutch and desk) . 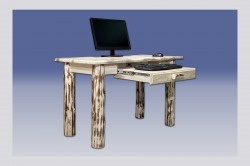 The small laptop desk is just the right piece for students and space limited areas. The reversible drawer can be used as a keyboard tray or laptop storage area. These small space desks are great for college kids. 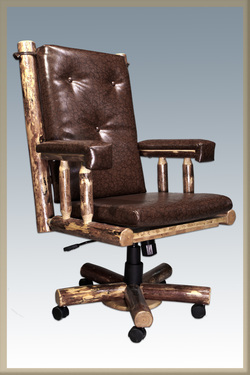 Desk measures 48" x 24" x 31"H.
Worthy of being called a "throne", this rustic office chair is constructed with solid lodge pole pine and quality swivel, lift, padding and wheel parts. 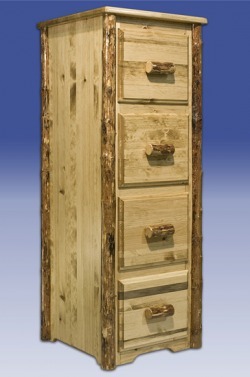 Solid pine, edge-glued laminated panels provide strength and durability while the lodge pole pine accents add rustic charm and allure to these VERY heavy duty filing cabinets. Full-extension drawer slides allow nearly effortless use of the letter sized filing drawers even when heavily weighted. Solid pine, edge-glued laminated panels provide strength and durability while the hand-peeled, lodge pole pine accents add rustic charm and allure. Full-extension drawer slides allow nearly effortless use of the letter sized filing drawers even when heavily weighted. 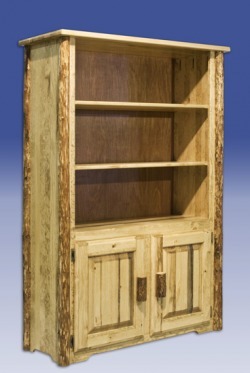 This rustic style amish built bookcase with hand-peeled, lodge-pole pine accents is sure to stand out in any home or office. 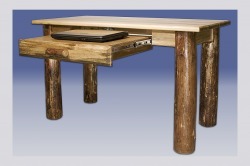 Visit our secure website at www.AmishLogFurniture.com to shop from your home and furnish your office with rustic log furniture today!